Through his comprehensive study of the effects of chemicals in the human body, Paul Ehrlich (1854-1915) fathered the fields of chemotherapy (the treatment of disease with chemical agents) and hematology (the study of blood). He also made important contributions to the understanding of immunity and discovered Salvarsan, the first effective treatment for syphilis. Ehrlich was born in 1854 in Strehlen, Germany, to a prosperous Jewish family. His interest in biology and chemistry led him to study medicine. He attended universities in Breslau, Strasbourg, Frieberg-im-Briesgau, and Leipzig, earning his medical degree in 1878. Ehrlich was fascinated by the reactions of cells and tissues to dyes. He developed new ways of staining cells to identify different types during his research. In 1890, Ehrlich became a professor at the University of Berlin, where he worked with Emil von Behring (1854-1917) and Shibasaburo Kitasato (1852-1931) on the study of the immune system (the body's method of fighting disease). The group searched for a substance that would give immunity against diphtheria (an infectious disease that effects the air passages) using antitoxins (natural antibodies). Ehrlich worked on the chemical aspects of the study and, in 1892, announced the development of a diphtheria antitoxin for medical use. He shared the 1908 Nobel Prize in medicine with Soviet biologist Elie Metchnikoff (1845-1916) for their work on immunity and serum therapy. In 1894 Ehrlich was made director of a new institute for serum research in Frankfurt, Germany, where he studied the concepts of active and passive immunity. Ehrlich also continued his study of blood using staining techniques. Realizing that stains colored bacteria but not surrounding cells, he looked for a way to combine the stain with a substance that could kill the bacteria. He did identify dyes, such as trypan red, that had the ability to destroy microorganisms on their own. Ehrlich began working with organic compounds containing arsenic because he thought its properties were similar to those of the nitrogen atoms that gave trypan red its effectiveness. He studied literally hundreds of arsenic compounds. By 1907, he had reached number 606, which he put aside because it was not effective against trypanosomes. However, two years later, Ehrlich's assistant, Sahachiro Hata (1872-1938), discovered that compound number 606 was effective against the fatal, sexually transmitted disease of syphilis. Triggered by a microorganism called a spirochete, syphilis causes the nervous system to break down, eventually leading infected people to experience intense pain and insanity prior to death. 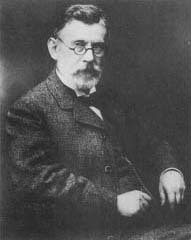 In 1910 Ehrlich announced that chemical 606, which he called Salvarsan, could cure syphilis. For several years Ehrlich suffered personal and professional attacks because of his work with syphilis. Some people felt that the disease was a punishment for sinful sexual behavior and attacked Ehrlich for searching for a cure. The administration of the drug was also complicated, even risky at first, and when a few patients died because doctors administering the drug failed to follow Ehrlich's instructions, he was accused of fraud. The attacks finally ceased in 1914 when the German parliament finally endorsed his cure as authentic. Unfortunately, the strain surrounding his controversial efforts to cure syphilis took its toll on his health and he suffered a series of strokes during his last year which led to his death in Bad Homburg, Germany, in 1915.